Construction of one of the most important crossings on the St Petersburg Ring Road, the Neva River cable-stayed bridge, is now well under way and due for completion in November this year. Approximately 40% of the cables had been erected when Bd&e went to press at the end of January, with 16 pairs erected on one tower, and six pairs on the second tower. The twin pylon structure has a cable-stayed span with a main span of 382m and two back spans each of 174m long. 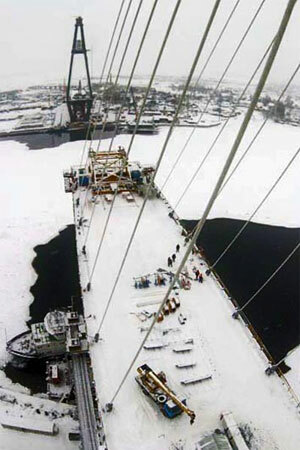 The deck is supported by a total of 112 stay cables in 56 pairs – 28 pairs on each pylon. Both the deck and the pylons are made of steel. During construction, the deck segments are fabricated by bolting together several elements to create a 24.9m-wide, 2.4m-deep and 12m-long double box girder segment that weighs 120t. There are two pylons which are also built of segments of varying sizes and geometries, also bolted together to construct the pylon to a full height of 124m. Pylons are A-shaped and taper from 6m wide at the top to 30m at deck level, reducing gradually again to width of 20m at the foot of the structure. The base is secured to a pad footing that measures 25m by 12.5m and is supported by 50 piles of 1.5m diameter extending to depths of up to 25m. The pylon dimensions and its form were preferred over other options because it allows for the possibility of using the same angle for all stay-cables, in contrast to a Y-shaped pylon – plus it also results in greater transversal stiffness when compared with H-shaped pylons. Erection sequence of the deck at each of the two pylons is independent and two different methods are being used. At one pylon, the erection is being carried out using the typical balanced-cantilever method, while the other involved supporting the completed back span on temporary structures after which the erection of the main span segments was carried out. A pair of stay cables anchored above deck level along the edges of the segment was used as support for each main span segment. For every pair of main span stay cables there is a pair of back span stay cables to counteract the induced overturning moment.